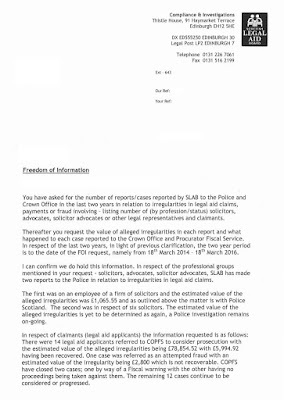 Police & Prosecutors investigate lawyers for legal aid fraud. THE Scottish Legal Aid Board (SLAB) has confirmed a number of solicitors are currently under investigation by Police Scotland for alleged legal aid fraud. The admission by Legal Aid chiefs – via Freedom of Information legislation - comes after journalists received tip offs relating to “high value” long term investigations involving a number of law firms and solicitors chiefly in the west of Scotland. And, all the solicitors who are under investigation by Police Scotland and the Crown Office & Procurator Fiscal Service (COPFS) - are still working for law firms who are able to claim more public cash – despite substantive allegations they cheated taxpayers. The first was on an employee of a firm of solicitors and the estimated value of the alleged irregularities was £1,065.55 and as outlined above the matter is with Police Scotland. The second was in respect of six solicitors. The estimated value of the alleged irregularities is yet to be determined as again, a Police investigation remains on-going. The Scottish Legal Aid Board also confirmed fourteen applicants for legal aid had been referred to the Crown Office. There were 14 legal aid applicants referred to COPFS to consider prosecution with the estimated value of the alleged irregularities being £78,854.52 with £5,994.92 having been recovered. One case was referred as an attempted fraud with an estimated value of the irregularity being £2,800 which is not recoverable. COPFS have closed two cases; one by way of a Fiscal warning with the other having no proceedings being taken against them. The remaining 12 cases continue to be considered or progressed. However, since SLAB confirmed the Police probes - information has come to light a number of solicitors who are now banned from the Legal Aid register and some who have ‘voluntarily’ withdrawn after headline SLAB investigations - are still profiteering from legal aid cash. The claims come as Scotland’s legal profession – led by the Law Society of Scotland – plot a strategy to resist ex Finance Secretary John Swinney’s announced cuts to the Legal Aid budget - which has soared to over £150 million a year - resulting in Scottish lawyers handed over £1.2 billion of public cash since the financial crash of 2008. Enquiries by the media have also uncovered a new type of legal aid scam - whereby lawyers who currently cannot claim legal aid due to previous instances of defrauding the public purse - are now receiving hefty payments in the form of large referral fees from other local law firms they pass on civil & criminal clients. The law firms who gain extra legal aid business from former legal aid solicitors – are suspected of inflating their own legal aid claims to cover referral fees paid to the referring solicitor. One client - who did not wish to be identified - told journalists how his solicitor - already named in the media in relation to legal aid irregularities – passed on a civil damages claim against a West of Scotland local authority to another firm of solicitors in the same area. The client later became aware an arrangement had been made by the second law firm for referral fees to be provided to the original solicitor. The claimant was told if any problem arose or he was asked questions, he was to reply by stating his original solicitor was kept on in the case as his office was closer in terms of accessibility. The client – who’s claim is being funded by civil legal aid – told journalists he was asked to go to three consultations with his original solicitor - all of which were suddenly cancelled at the last minute. However, the client was asked to go to his new legal representatives for a consultation where his second lawyer claimed ‘valuable information had been learned from the consultations’ – which never took place. Material which has emerged in relation to this case suggests the non-existent consultations – have since been charged up to legal aid. A number of similar cases have since been identified involving the same solicitor who is now ‘de-registered’ from the Legal Aid register – potentially costing taxpayers tens of thousands of pounds in inflated legal aid claims designed to channel payments back from law firms still on the legal aid register - to the referring solicitor. Most of the cases so far uncovered appear to involve small to medium sized civil claims against housing agencies, public bodies including health, local authorities and some private businesses. Speaking to journalists, an individual who formerly specialised in complex financial investigations of law firms said the scale of fraud involving inflated legal aid claims being used to provide referral fees to de-registered and ‘non legal aid solicitors’ “is substantial” and “difficult to get to grips with”. The individual also gave an account of a case where he alleged financial documents had been removed - under audit powers - from a law firm currently implicated in a multi million pound mortgage fraud racket – to shield a well known solicitor who formerly held high office at the Law Society of Scotland. It is unknown if the Crown Office or Police Scotland have requested sight of the material from the legal profession’s regulator. A previous investigation by DOI into the lack of prosecutions by the Crown Office revealed fourteen cases were sent to prosecutors, with not one case going to court. One solicitor even registered a plea of “insanity” to avoid being prosecuted for legal aid fraud. In relation to the final solicitor, the matter remains under consideration. 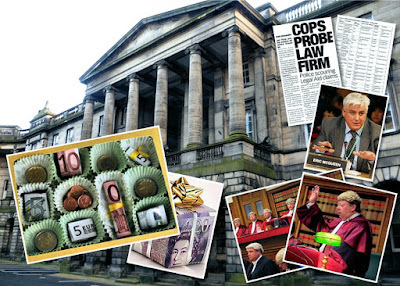 Court staff accepted gifts from lawyers being investigated by Police. DOCUMENTS obtained by journalists reveal just a few days after Lord Carloway was named as Scotland's new top judge – Court staff employed by the Scottish Courts and Tribunals Service (SCTS) accepted gifts from law firms under criminal investigation for alleged legal aid fraud. The information came to light in an unpublished register of gifts and hospitality to Scottish Court Service staff - released in response to a Freedom of Information request. The ‘Gifts and Hospitality’ register now identifies law firms & hospitality providers - after DOI journalists previously approached Scottish Information Commissioner Rosemary Agnew for help in breaking court secrecy. Entries in the latest gifts register reveal that on 22 December 2015, Central Court Lawyers gave hospitality in the form of ‘Cake, 6 wine and 12 beers’ to Livingston Sheriff Court staff - who then entered the items into a "staff raffle". 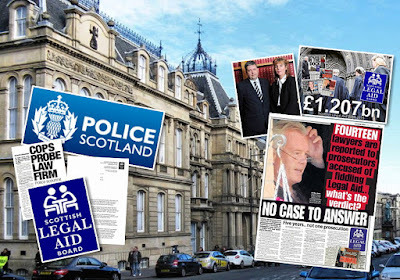 However, it was reported by the media during February 2015 that Central Court Lawyers were under investigation by Police Scotland for irregularities in legal aid claims. Last year, when the story was reported, Police Scotland confirmed "Central Court Lawyers are assisting us with our inquiries." Officers are thought to have interviewed serving and former employees of Central Court Lawyers as part of their inquiry, which began in 2014. Central Court Lawyers – based in Livingston – was established by lawyer Neil Robertson and solicitor-advocate Ian Bryce in 1997. Ian Bryce has held a number of positions at the Law Society of Scotland, including vice-convener of the legal aid negotiating team. Central Court Lawyers has previously been included in the Legal 500 - a publication listing the top law firms in the UK. The Hospitality & Gifts Register 2015-2016 reveals staff took hospitality from legal aid probe lawyers. In response to media enquiries, a spokesperson for the Scottish Courts & Tribunals Service (SCTS) claimed gifts had not been accepted. The spokesperson said: “SCTS staff at Livingston Sheriff Court have not accepted hospitality from Central Court Lawyers. A small gift was accepted on behalf of staff in December 2015 and entered in the staff Christmas raffle. The SCTS were asked why staff accepted gifts from law firms under investigation by Police Scotland for legal aid irregularities. 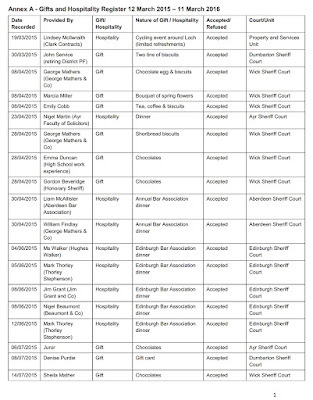 Previous versions of the hospitality register - Hospitality and Gifts to Court Staff 2010-2013 - have also included the names of solicitors such as Niels S Lockhart – who was investigated by the Scottish Legal Aid Board after he claimed over £600K in just two years. Lockhart – who gave hospitality to staff at Ayr Sheriff Court in 2012 - subsequently withdrew from the legal aid register - with no action taken by the Law Society of Scotland or the Scottish Legal Aid Board. Asked for comment on the current status of the investigation into Central Court Lawyers, the Scottish Legal Aid Board refused to provide further details. Court staff at Hamilton Sheriff court were also rapped on the knuckles for failing to properly record gifts from a number of local law firms who operate in the area. An entry in the register reveals "A number of local solicitors firms including but not restricted to:Kenneth Greener & Co; Linda George Family; Diarmid Bruce; Ness Gallagher; Lanarkshire Law Practice gave "25 boxes/tins of chocolates; 10 boxes of biscuits; 18 bottles of wine; 2 bottles of spirits; 21 miniatures of whisky/baileys; 3 large cakes; 1 recipe book." to local court staff. The failure to adequately record the 'hospitality' drew ire from Court chiefs who said "The correct procedure for recording gifts was not followed in this instance. Management in this court has been reminded of the need to follow the procedure in future." A number of law firms & solicitors who operate at Hamilton & Livingston Sheriff Court have previously been investigated for legal aid fraud. 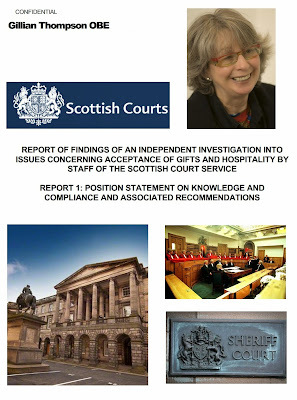 Previously - Diary of Injustice reported on concerns regarding hospitality involving Scottish Court Service employees where Gillian Thompson – who now serves as Judicial Complaints Reviewer (JCR) - was asked by the Scottish Court Service to investigate reports of irregularities in hospitality given to court staff. The request for the investigation came after the Scottish Court Service received Freedom of Information requests regarding hospitality in the courts, prompting concerns some staff may have accepted gifts or hospitality but failed to register. Report said SCS Registers insufficient, Court staff involved in private gains failed to declare. Gillian Thompson’s Report on Hospitality & Gifts in the SCS stated: “The information currently captured on the registers is insufficient to provide assurance that staff are using their common sense and considering issues such as conflict of interest. Ms Thompson recommended in her report the “SCS should bring the practice of sheriff clerks profiting privately from their employment by SCS to an end as quickly as possible”. However, the Freedom of Information request – from DOI – triggered a review of hospitality policy at the Scottish Court Service, leading to names of ‘'hospitality’ providers being added to the register. After a request for review of refusal to disclose the information, the SCS again refused - this time around, claiming it would cost them too much to contact each law firm to ask permission to disclose their ‘hospitality’ to court employees. The SCS claimed they would have to contact every lawyer who gave a gift and this would cost too much to provide the information. DOI journalists took the matter up with Rosemary Agnew - the Scottish Information Commissioner – who requested Courts Chief Eric McQueen provide an explanation as to why the courts were blocking release of information on hospitality relationships between the legal profession and court staff. 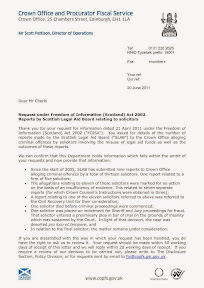 After the intervention of the Scottish Information Commissioner, the SCS subsequently released the hospitality list to DOI. While the position of Scotland's latest top judge on court staff transparency is unknown - Lord Carloway has already attacked proposals to bring the judiciary into line with court employees and others in public life who are required to register their interests, gifts and hospitality. Carloway recently attacked proposals before the Scottish Parliament - Petition PE1458: Register of Interests for members of Scotland's judiciary – calling on judges to register their own interests and hospitality. Reported in further detail here: LORD NO-WAY: Top judge Lord Carloway hits out at judicial interests register proposal – Lord Carloway claimed justice could grind to a halt in a constitutional calamity if judges were forced to declare their vast wealth, property owning interests, professional links and other financial affairs – just like politicians, members of public bodies, local councillors are required to reveal in publicly available registers. The widely supported proposals - debated at the Scottish Parliament on 9 October 2014 - call for the creation of a publicly available register of judicial interests containing information on judges backgrounds, their personal wealth, undeclared earnings, business & family connections inside & outside of the legal profession, offshore investments, hospitality, details on recusals and other information routinely lodged in registers of interest across all walks of public life in the UK and around the world. Previous articles on hospitality and gifts to the Scottish Courts and Tribunals Service, reports on gift giving to court employees and investigations by Diary of Injustice on the relationship between law firms and SCTS staff can be found here Hospitality and Gifts to the Scottish Courts. Law Society switch brokers on dodgy insurance scheme. AN INSURANCE scheme operated by the Law Society of Scotland - which covers all Scottish solicitors - and is designed to ‘protect’ consumers when lawyers walk off with their cash and other assets - has announced a change of brokers from Marsh to Lockton. The switch was announced last week by the Law Society – who said brokers Lockton will administer and broker the Master Policy of Professional Indemnity Insurance from 1 January 2017. The move comes after Marsh – who managed the policy for nearly 40 years - lost the five yearly tender process in April 2016 to Lockton. The Master Insurance Policy is a compulsory Professional Indemnity Insurance arrangement enforced by the Law Society upon all solicitors in Scotland. The scheme includes all in-house solicitors who work for the Scottish Government and lawyers from the Government Legal Service for Scotland (GLSS) seconded around public bodies and other branches of the Executive such as the Scottish Parliament and justice bodies. The Master Policy claims to provide cover of up to £2 million for any one claim where the solicitor is ‘established’ to have been negligent. However, the process of establishing whether a solicitor is negligent or not – is controlled by the legal profession and the courts. However, the claims – echoed from Jack’s predecessor – Douglas Mill – were previously & spectacularly taken apart by Deputy First Minister & Finance Secretary John Swinney, during a Scottish Parliament investigation into self regulation of the legal profession in 2006. Mr Swinney branded the Law Society & Master Policy as manipulative after Mill claimed the Law Society kept a distance from the client compensation insurance arrangements. Mill went onto “swear on his granny’s grave” he and the Law Society had never intervened in a compensation claim. However, the memo - produced by Swinney during the Holyrood hearing - came to illustrate the significant level of dishonesty and manipulation with regard to the ‘consumer protection policy’ – which despite Mill’s claims to the contrary – rarely pays full compensation after lawyers swipe clients assets. The Master Policy was more recently linked in a Research Report to deaths and suicides of clients who attempted to claim back hundreds of thousands of pounds taken by legal agents engaged in corrupt practices not covered by an alternative Scottish Solicitors Guarantee Fund run by the legal profession. The independent report, compiled by legal academics Professor Frank Stephen & Dr Angela Melville from the University of Manchester School of Law - concluded the Master Policy “is simply designed to allow lawyers to sleep at night.” rather than protect consumers from rogue elements within the legal profession. According to the report "claimants described being intimidated, being forced to settle rather than try to run a hearing without legal support, and all felt that their claims’ outcomes were not fair. Some claimants felt that they should have received more support, and that this lack was further evidence of actors within the legal system being “against” Master Policy claimants. Judges were described as being “former solicitors”, members of the Law Society – and thus, against claimants. Some described judges and other judicial officers as being very hostile to party litigants." Cases referred to in the report describe scenarios where consumers are commonly forced to become party litigants after the Law Society intervene in the claims process, forcing claimants legal representatives to withdraw from acting in financial damages claims against against other solicitors. The Research Report sourced comments from claimants: "I keep fighting cases, and they keep coming at me, and now I have become ill. But they still keep coming at me. They threw me out onto the street, I couldn’t get my medication, I’ve got nothing, I was homeless, ill, sleeping in the car. Now I am appealing. But I can’t get a solicitor. They are just shutting me down…. My health has been damaged, they kill you off. It's a proven fact. All of us have stress related problems after years and years of stress." The report also linked the Law Society’s insurance scheme to suicides of clients who attempted to claim back funds appropriated by corrupt solicitors. The report stated: "Several claimants said that they had been diagnosed with depression; that they had high blood pressure; and several had their marriages fail due to their claim. Some had lost a lot of money, their homes, and we were told that one party litigant had committed suicide." Dr Angela Melville - who interviewed many clients for her final report, confirmed the research team did not receive a copy of the Master Policy itself after Marsh director Alistair J Sim, demanded strict conditions for the disclosure of the insurance policy’s terms. 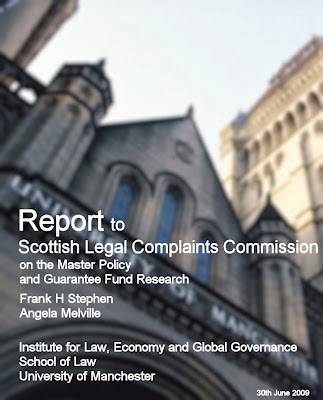 No further research has been commissioned by the Scottish Legal Complaints Commission since the report was published in 2009, and with the SLCC now under substantive control of the Law Society of Scotland, much of what it produces by way of research and statistics is widely recognised as having little honest value in terms of consumer protection. The Master Policy started in November 1978 under brokers Sedgwick Forbes UK Limited, which later became part of the Marsh Group. Given the highly specialist nature of professional indemnity insurance, the brokers play a vital role in arranging and securing the insurance cover as well as providing administration, advice, as well as risk management training. 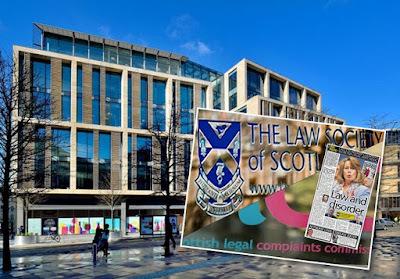 Along the years, law firms acting for the Master Policy included Simpson & Marwick – now merged with Clyde & Co, Balfour & Manson and other ‘big name’ law firms brought in to demolish consumers attempts to reclaim millions of pounds lost, misappropriated or embezzled by Scottish solicitors. While the Master Policy is tasked with dealing with claims for negligence, the Law Society has been known to manipulate claims on a serial basis. Unsurprisingly, even claims which do succeed against the Master Policy bear little return to clients who are forced to go through lengthy court processes in front of a judiciary who have also previously paid into the same Master Policy arrangement while serving as solicitors in their earlier years prior to the bench. Crown Office set to have new Lord Advocate SCOTLAND'S Crown Office & Procurator Fiscal Service (COPFS) - based in Edinburgh - would not be out of place in a Pirates of the Caribbean movie. Seriously. Remember the opening sketch from At World’s End – where the line of accused sing while walking to the gallows - as various repeals of statutes, rights & laws are ordered suspended. If one were to loiter around gatherings of prosecution robes in Sheriff courts up and down the land, one would quickly discover this is how some view justice and how to score a conviction, guilty or not. Headlines and PR please. Who cares about due process and the quality of evidence – that is the stuff of entertainment, drama and fiction. Thank goodness then, for criminal defence solicitors … well, at least the dutiful, attentive & hard working ones. 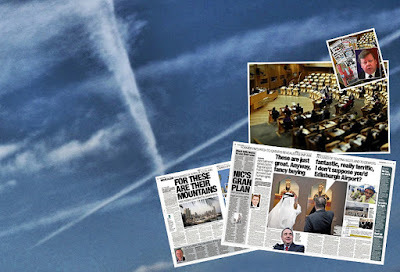 Evasion, introducing dodgy evidence into a trial – lets just call it lying, telling plod to read from an empty note book, dead people on witness lists, private briefings against judges who signed a petition to retain key parts of Scots Law such as corroboration. The Crown has done it all. Ask any solicitor – well, a decent one. Even the judiciary know it. Not too difficult to spot. Incompetence, corruption, links to gangsters, stage managed media, interference in investigations and subtle threats to anyone who stands in their way of a quick verdict. What £110 million a year – the cost of the Crown Office - buys you. Really. The truth is, standards have slipped at Scotland’s Crown Office. And we all know it. Some may say, were there ever any real standards at the Crown Office? Well - there is an unpalatable answer to that one. But let us not forget, we are here today to sit upon the ground and tell sad stories of the end of one Lord Advocates career in office ... and the beginnings of another. Among the massed ranks of gangsters, corrupt public officials, legal aid thieving lawyers, the occasional declare-dodging judge waddling along with gemstones, krugerrands, loads-a-property and offshore trusts jingling in their back pockets, there are a platoon of prosecutors who are tasked with keeping the lid on all of it. That lid – needs a boss. You know – someone to keep Edinburgh’s version of Al Capone’s Hotel Lexington in fancy red carpets and baseball bats. And so we come to the role of Lord Advocate. The boss of it all. The current Lord Advocate, Frank Mulholland, announced back in March he plans to step down in May. Mr Mulholland previously served as Solicitor General and succeeded Dame Elish Angiolini QC as Lord Advocate in 2011. Speaking of his intention to quit, the Lord Advocate said: “It has been a real privilege to serve as Lord Advocate, leading Scotland’s prosecution service and providing independent legal advice to the Scottish Government . However, after nine years as a Law Officer – the last five as Lord Advocate - I have decided it is the right time to step down and do other things. He added: “It’s been an honour to do this job working with so many dedicated and talented people to deliver justice in some of the most demanding and challenging of cases. He was duly praised by First Minister Nicola Sturgeon, who said: “Frank Mulholland has fulfilled the challenging roles as head of Scotland’s prosecution service and as the Scottish Government’s principal legal adviser, with dedication, energy, integrity and intellect. “He has played a central role in many innovations to our justice system, including leading Scotland’s first successful ‘double jeopardy’ murder prosecution and agreeing a historic communiqué with the heads of prosecution services from across the UK and Ireland to work together to tackle the cross-border crime of human trafficking. “It is clear that he has worked to bring about change to ensure that the system makes a real difference to people’s lives, and his dedication to the law and his compassion for others has been behind that drive. Nothing about the decision to refuse to prosecute anyone over the deaths of six members of the public in Glasgow Bin Lorry deaths case – and countless other deaths in similar situations. Nothing about inaction in a three year probe of a £400 million collapsed Hedge Fund with links to the judiciary who just happened to represent Scotland’s top politicians and former Lord Advocate. Nothing about shredding statistics so the Scottish Parliament’s Justice Committee could not investigate claims in the Offensive Behaviour at Football and Threatening Communications (Scotland) Act 2012. Nothing about significant numbers of collapsed cases involving notorious Scottish crime clans – this after being fed yearly Crown Office press releases on crime gangs & professional advisers, none of whom are ever caught. Nothing about slipping £500K of bonuses to Crown Office prosecutors for a job not well done. Nothing about the real reasons for the introduction of Double Jeopardy – because Prosecutors were - and are - just not up to the job. Nothing about the Crown Office role in the plot to remove Corroboration from Scots Law. And what a plot that was. Nothing about Prosecutors very own crime gang – where Crown Office Prosecutors teamed up with criminals, leaked case files, used drugs & much more. Oh, and nothing about Prosecutors escaping jail for some of the worst imaginable crimes on the go. Of course - as we all know - fond farewells are often fond - and written by candle light with a teary eye. Perhaps not always fair to blame the boss, right? It’s the institution. Some would say that. Even a clear thinking Scottish Minister, at least privately. Institutionally corrupt, institutionally racist .. the Crown Office has been branded many things over the years, and rightly so with the evidence before our very eyes. So, if the institution is to function as it should, a change is needed, much more than a simple elevation of another part of the problem to higher office. Step up - the next overseas jet set junket, expenses claiming, bonus paying, investigation meddling & truth bending Lord Advocate. Currently, there is a dirty cash probe into the financial affairs of the Lord Advocate’s brother. Previously, it has also been reported a relative of the current Solicitor General was convicted of criminal offences involving violence against women. The same Solicitor General represented the Crown during the Fatal Accident Inquiry into the Glasgow Bin Lorry deaths - where a decision was taken not to prosecute anyone over the “preventable deaths”. The Crown team’s failure subsequently forced the families of victims to attempt a private prosecution after the justice system and Crown Office, let them down. And mystery now surrounds how one former high ranking law officer was rejected for a judicial position after intense lobbying for the candidate by a dodgy member of the judiciary linked to top politicians - raised several judicial wigs & brows. In an update to this published article, the Scottish Government announced on May 11 2016 that retiring Lord Advocate Frank Mulholland has been appointed as a judge. Among five senators appointed to the College of Justice, Frank Mulholland QC, Sheriff John Beckett QC, Ailsa Carmichael QC, Alistair Clark QC, and Andrew Stewart QC will sit as judges in the Court of Session and the High Court of Justiciary. Their appointments take effect on dates to be agreed by the Lord President. Four of the appointments are to fill existing vacancies. The fifth judicial appointment, to be taken up by Frank Mulholland QC, will take effect following the retirement of a senator later in the year. The appointment of Mulholland to a judicial position comes after the recent appointment of Lord Carloway to the top post of Lord President – head of the Scottish judiciary. Law Society launches campaign to protect £1m legal aid pay-outs to crooks. ON THE day Scotland elected a minority SNP Government, the Law Society of Scotland has revealed it organised a ‘19,000 plus’ email lobbying effort targeted at candidates in the 2016 Scottish Parliament elections – aimed at ‘protecting’ over £150m a year in legal aid public cash hand-outs to lawyers. 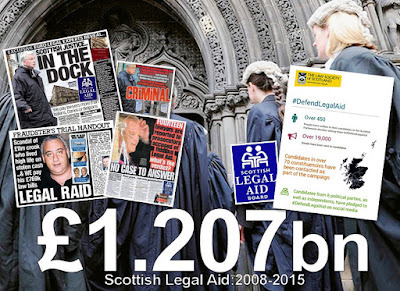 The campaign – organised under the guise of ‘access to justice for all’ – criticises recent cuts in the huge Scottish Legal Aid Board (SLAB) budget – which has seen a staggering £1.2 billion of taxpayers cash paid out to lawyers and their criminal clients since the financial crash of 2008. As part of the campaign, the Law Society said it had encouraged both solicitors and members of the public to contact their candidates for the Scottish Parliament elections to ask them to support access to justice, along with a twitter campaign with the hashtag #defendlegalaid”". Alongside a document titled Legal Assistance in Scotland fit for 21st Century, the Law Society launched a PR video in an attempt to persuade the public to support a drive to hand out millions more in public cash to lawyers. 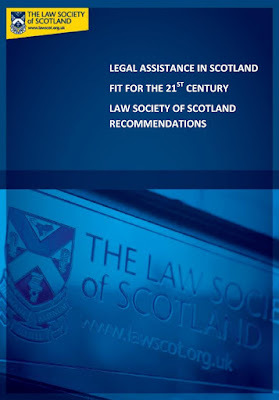 Further research was carried out with lawyers during 2015 – coming just after it was revealed the Law Society had rigged a client satisfaction survey, publishing spurious claims of high client satisfaction with Scottish solicitors across several media outlets - the articles authored by the Law Society’s own President. The 2015 survey of the legal profession claims to indicate 78% of solicitors surveyed believed “Scottish Government policy on legal aid risked undermining access to justice for the poorest in society”, with 77% of lawyers in the survey allegedly demanding an increase in legal aid rates. Commenting on the latest campaign against legal aid cuts, Christine McLintock, President of the Law Society of Scotland said: “We recognise that like all public sector funding, the justice budget is under significant pressure. However legal aid funding is quite simply the cost of access to justice for those in need. Ms McLintock continued: “Access to justice is an essential element of a fair and democratic society and we have highlighted it as one of one of our key priorities for this year’s Scottish election. Providing access to quality legal advice and representation for people, regardless of their financial means, helps tackle inequality, encourages early resolution of problems, and protects fundamental rights. “While our legal aid system is designed to meet costs on a case-by-case basis, there are fees for particular types of work which were set in 1992 and have not been revised. Christine McLintock attacked the cuts to the legal aid budget, saying : “The legal aid budget was reduced from £161.4m in 2010/2011 to £138m in 2014/15. The target budget for 2016/17 is £126.4m – more than a £10 million reduction – and is less in cash terms than 20 years ago which, accounting for inflation, represents around a 50% cut in real terms over those two decades. in one media investigation, it was revealed Fourteen lawyers accused of defrauding millions of pounds of legal aid public cash escaped prosecution after Scotland’s Crown Office & Procurator Fiscal Service (COPFS) refused to prosecute any of the cases reported to prosecutors by the Scottish Legal Aid Board. In another case brought to light by the media – Niels S Lockhart - a Kilmarnock based solicitor took over £600,000 of legal aid cash in just two years – and even when allegations of dodgy claims were reported to the Law Society an investigation by the Scottish Legal Aid Board – the Law Society of Scotland failed to act. A FRAUDSTER who flew in private jets and lit cigarettes with burning £50 notes was handed £769,000 in legal aid. 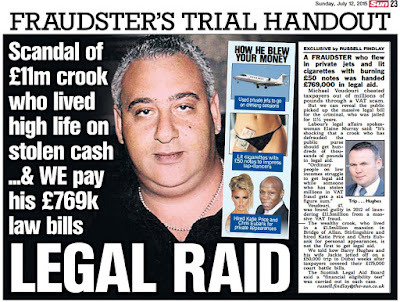 Michael Voudouri cheated taxpayers out of millions of pounds through a VAT scam. But we can reveal the public picked up the massive legal bill for the criminal, who was jailed for 11 1/2 years. Labour's legal affairs spokeswoman Elaine Murray said: "It's shocking that a crook who has defrauded the public purse should get hundreds of thousands of pounds in legal aid. "Ordinary people on low incomes struggle to get legal aid while someone who has stolen millions in VAT fraud gets a six figure sum." Voudouri, 47, was found guilty in 2012 of laundering £11.5million from a massive VAT fraud. The wealthy crook, who lived in a £1.5million mansion in Bridge of Allan, Stirlingshire and hired Katie Price and Chris Eubank for personal appearances, is not the first to get legal aid. We told how Barry Hughes and his wife Jackie jetted off on a £50,000 trip to Dubai weeks after taxpayers covered their £175,000 court battle bills. The Scottish Legal Aid Board said a "financial eligibility test" was carried out in each case. THE European Commission report reveals that Legal Aid in Scotland cost 203million euros (£161million) in 2010 - more than in Italy, which has a population of 61million. SCOTS lawyers collected more taxpayers’ cash for Legal Aid than their counterparts in Italy – a country 12 times the size. A European Commission report reveals that Legal Aid in Scotland cost 203million euros (£161million) in 2010 – around 39 euros, or £31, for every one of our 5.2million people. Lawyers in Italy, which has a population of 61million, got just £100million of public cash – £1.50 per person. The 450-page Brussels report also found that Denmark, with 5.6million people, paid its lawyers only 88million euros (£70million). And in Belgium – population 10.9million – legal aid cost 75million euros (£59million). The revelations, in a 450-page report by the European Commission for the Efficiency of Justice – came as the Scottish Legal Aid Board banned three lawyers from claiming cash for criminal cases. We can reveal that Gerard Tierney, Massimo D’Alvito and Andrew Brophy, of Blantyre, Lanarkshire, breached the board’s code of practice. Tierney and D’Alvito have been reported to the Crown Office, who will decide whether to prosecute. The ban also extends to Tierney’s firm G Tierney & Co, of Auchinleck, Ayrshire, who have raked in £610,500 in Legal Aid over three years, and Edinburgh firm Massimo D’Alvito Defence Lawyers. The European report looked at 47 criminal justice systems across the continent. It found the cost per person of Legal Aid in Scotland was third-highest – behind only Northern Ireland and England and Wales. The cost per person was 53.5 euros in Northern Ireland and 45.7 euros in England and Wales. The findings led to calls for a radical overhaul of Legal Aid. Central Ayrshire Labour MP Brian Donohoe said: “It seems major organised criminals and terror suspects qualify for unlimited Legal Aid, yet I have constituents who don’t get a penny simply because they have a few thousand pounds of savings. The Sunday Mail has exposed a series of rogue lawyers banned from claiming Legal Aid. But none of the 14 reported to prosecutors was put in the dock, prompting claims that Scotland’s legal self-regulation system protects lawyers. Kilmarnock solicitor Niels Lockhart, who took £600,000 in Legal Aid in just two years, was found to have made “unnecessary and excessive” claims. The Legal Aid board withdrew their complaint to the Law Society after he agreed to stop claiming. Reacting to the Brussels report, the Scottish Legal Aid Board said: “Across Europe, there are substantial differences between judicial systems and very different approaches to the provision of legal aid and its cost. “The Scottish system is highly regarded internationally for the efforts made to ensure access to justice. Justice Secretary Kenny MacAskill hopes to cut the Legal Aid bill by making criminals pay some of their costs. The planned move, outlined in a Holyrood Bill, could save taxpayers around £3.9million. • The Euro study showed that Scotland disciplined a tiny number of lawyers compared to countries of similar size. Just three were struck off and 13 reprimanded in Scotland in 2010. Denmark, with a similar population, took action against 309 lawyers, with six struck off and 145 fined. And in Finland, also close in size, 99 rogue solicitors were sanctioned. Critics blame the Law Society of Scotland’s dual role of representing lawyers while also acting as regulator. • A large proportion of alleged criminals reported to prosecutors in Scotland are not being put in the dock. Of 265,830 cases sent to the Crown Office, only 41.7 per cent were brought to court. In England and Wales, 90.6 per cent of all cases resulted in court action. The difference is thought to be partly due to Scotland’s recent introduction of spot fines and fiscal fines for what the authorities insist are more minor offences. Critics claim such fines lead to a secret justice system. • The report reveals that Scotland’s sheriffs top the European pay league. Researchers compared the wages of lower court judges across Europe. Our sheriffs, with an average salary of 150,106 euros (£120,000), were number one, ahead of the Irish and Swiss. Next were sheriffs’ counterparts in England and Wales, who were paid 120,998 euros (£95,000). Not only were sheriffs the highest-paid, they also topped the table comparing their earnings to the national average. They earned 5.2 times the average Scot’s wage. The Euro study showed that Scotland disciplined a tiny number of lawyers compared to countries of similar size. Just three were struck off and 13 reprimanded in Scotland in 2010. Denmark, with a similar population, took action against 309 lawyers, with six struck off and 145 fined. And in Finland, also close in size, 99 rogue solicitors were sanctioned. Critics blame the Law Society of Scotland’s dual role of representing lawyers while also acting as regulator. A large proportion of alleged criminals reported to prosecutors in Scotland are not being put in the dock. Of 265,830 cases sent to the Crown Office, only 41.7 per cent were brought to court. In England and Wales, 90.6 per cent of all cases resulted in court action. The difference is thought to be partly due to Scotland’s recent introduction of spot fines and fiscal fines for what the authorities insist are more minor offences. Critics claim such fines lead to a secret justice system. The report reveals that Scotland’s sheriffs top the European pay league. Our sheriffs, with an average salary of 150,106 euros (£120,000), were number one, ahead of the Irish and Swiss. Next were sheriffs’ counterparts in England and Wales, who were paid 120,998 euros (£95,000). Not only were sheriffs the highest-paid, they also topped the table comparing their earnings to the national average. They earned 5.2 times the average Scot’s wage. Who do you trust to represent your best interests? PEOPLE in power and people with power - always vote. Vested interests - always vote. And, so should you. Who you vote for is up to you. This is your choice, your voice, and your vote - so vote today. Regardless of the blurb and spin thrown your way, the fact is, these days Governments are only as good as their opposition. If there is no strong, substantive & coherent opposition, a Government can say what it likes, lie as much as it likes, do what it likes, to whom it likes. Who wants such a Government? Well … you know who. The vested interests of this world, big corporations, banks, money lenders and Lord No-No’s wearing their ermine & pound sign clad garments just love to wallow in the omnipotence brought by unaccountable governments & politicians who back them to the hilt. A fracking project here … a sale of an airport there … things can all be arranged for the highest bidder – just as long as any dodgy deal can be spun in some grubby Press Release written by … you know who … and paid for by you. When you hear some politician or power broker claim they must be so innocent because they received no mention in the Panama Papers (while doing their secret deals in Qatar instead) .. you know it is time to disbelieve or distrust much of what else they say. The true voice of Scotland is you - the Scottish people. You have the greatest vested interest in Scotland advancing with an accountable government, accountable public services, and yes - an accountable & transparent justice system. Why not? After all – you pay for it. All of it. Today, it is your choice, your voice, and your vote. So use it wisely. However you decide to vote, you have the right to decide for yourself.